Are you trying to eat the right nutritious food for general well-being? Building your body and muscles in a Gym? Or do you want to lose weight in a healthy way? Whatever your reasons are, your Diet should always be properly balanced in terms of Nutrients. Now you can easily make sure that it is. 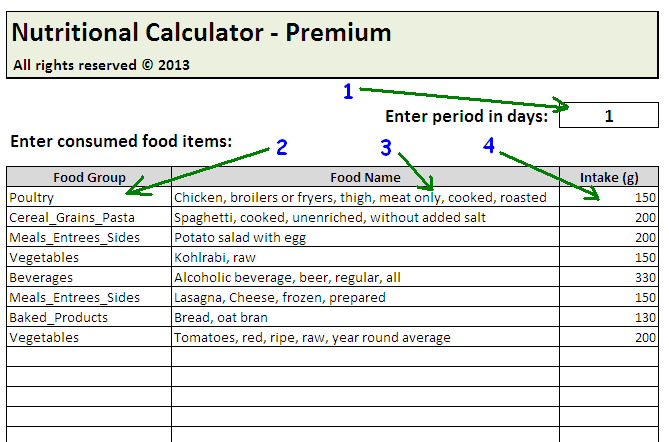 We have developed for you, our valued reader, this useful and unique Nutrition Calculator in Excel. Our Nutrition Calculator is designed for Microsoft Excel 2010, but will also work with Microsoft Excel 2007. We tested it on Windows operating systems. To make sure that it works on your computer you can download free version of the calculator and try to use it. If the Free version works fine then the Premium version will work fine as well. What Foods and Nutritional Values Are Included? 1. Massive database of 1923 hand-picked food items (click here for a detailed list). 3. 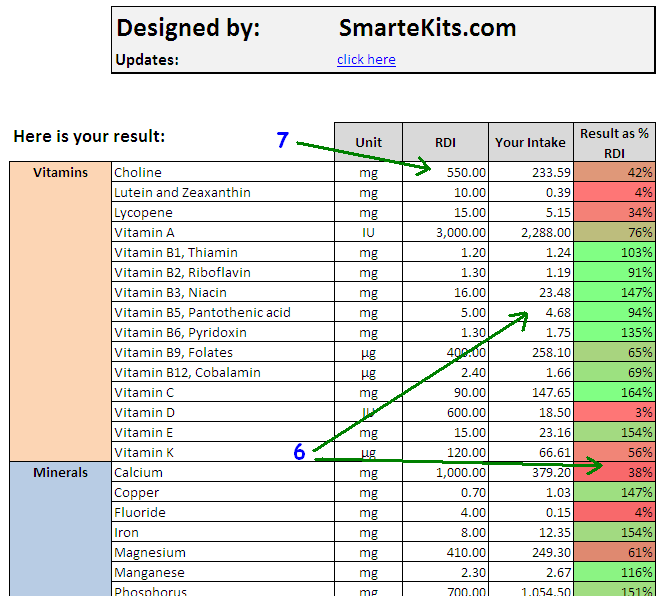 Pre-set recommended daily allowances (RDA / RDI) for each Nutrient. Free version contains a database of only 50 foods. If you like it then you can buy the Full version with 1923 foods. Plus you will also get our eBook Nutrition Content of Foods as a Bonus for FREE! IMPORTANT: After completing PayPal payment don’t forget to click “Return to Smart eKits” for your download link. Diets Plans are focused purely on Calories and neglect other important Nutrients your body needs to function well. Any lack of these and your Health will suffer. However, for a complete picture this isn’t enough! What about Vitamins, Minerals, Fiber or Cholesterol? We were frustrated with the lack of something really meaningful, simple and effective. Therefore, we developed this extremely useful Calculator that does all the hard work for you. How Will The Calculator Benefit You? Basically, in few minutes you’ll learn amounts of all essential Nutrients in your food. Making any necessary adjustments to your Diet will then be easy. You can find foods with high content of all missing Vitamins and Minerals here: Foods Nutrition Facts Guide. After finding suitable nutritious food, just add it into the Calculator. How Easy to Use Is It? Both our Nutrition Calculator and the FREE Foods Nutrition Facts Guide are extremely user friendly. To use the Calculator you need only a basic understanding of Microsoft Excel. Perhaps, not even that. We designed our Calculator to be extremely easy and intuitive. You still need Microsoft Excel to run it, but from there nothing more. This Calculator includes extensive database of Foods and their Nutritional Values. You can even modify it to your specific needs. For example, you can add new foods or include supplements you eat. Off course, to do these things you have to be skilled in Excel. Free version of the Calculator is locked against updates to protect our design know-how. However, if you buy the full version, this is fully unlocked and can be modified. Please note that we sell this Nutrition Calculator “as is”. If you choose to modify it then you will be responsible for all your updates. We do not provide technical support (except for our own errors) or perform troubleshooting of your customizations. Grab this Nutrition Calculator today and also get our eBook Nutrition Content of Foods as a bonus for FREE! To give you a better idea about the Calculator we prepared a set of detailed instructions for you. 3. Enter your food items – pick from a list of 1923 common foods. Food items will be displayed in the drop down list based on the Food Group selected previously. 4. Enter weight of consumed foods (or recipe ingredients) in grams. 5. Repeat steps 2 to 4 for all your food items (up to 100). Our Nutrition Calculator includes also Recommended Daily Allowances (7). The default values are set for an average adult. If you prefer your own RDA values then simply adjust them to whatever suits you best. They generally depend on gender (male / female), age (child / adult), actual weight and few other factors. You can find more information about Recommended Daily Allowances on this website. Start receiving all the Health Benefits our Calculator offers from day one. To buy this Calculator simply click the “Buy Now” button below. Plus you will get our eBook Nutrition Content of Foods as a bonus for FREE!